What kind of poker player do you consider yourself? Pro, semi-pro, hobbyest? Factors to consider. Ashley Adams asks poker players how exactly they classify themselves (pro, semi-pro, hobbyest?). It has been a great couple of months of poker for many of us, as we've been watching the results of the World Series of Poker. In many cases we've been playing a lot of poker, too, with summer vacation and all. With trips to Las Vegas, and many having time off from our day jobs, there might have been more poker than usual over the last couple of months. 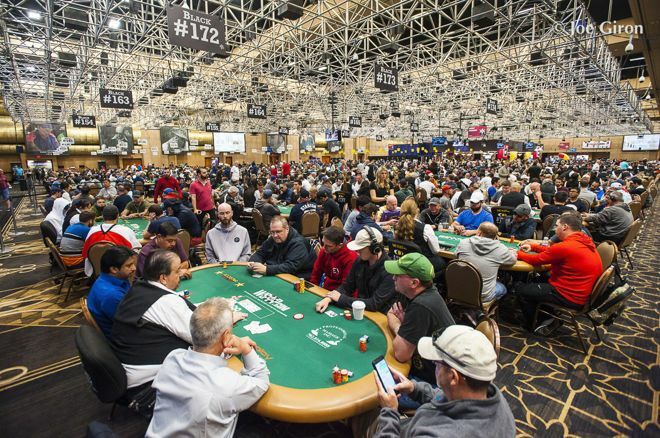 Good as it was, we might now be suffering the ill effects of too much poker. I think of it as a "poker hangover," which can take many forms. Some of us have depleted bankrolls. Some of us are sleep deprived. Some now have major deficits to make up related to family and work, given how much time we've spent away from each playing poker. All of this poker may be causing you to examine exactly what role poker plays in your life and whether it's healthy or unhealthy for you. It seems a good time then to pause for a few moments, and to consider our relationship to this game. Are we professionals? Perhaps we're semi-professionals? Are we healthy poker hobbyests, enjoying our fun without any expectation of earnings at the end of the year? Do we push poker to the point of an obsession, bordering on something that might actually be hurting our health and/or our relationships with others? Or have we completely crossed over into the danger zone, becoming compulsive gamblers in the process, as addicted to playing poker (and perhaps other forms of gambling) as an alcoholic is addicted to alcohol or a smoker is addicted to nicotine? Here are some questions you can ask yourself to help figure out where on the vast spectrum of poker players you really are. 1. Are you a professional poker player? This is a simple question to answer. You are a pro if you derive most or all of your income from playing poker. It's your job. That means you support yourself, chiefly, not from a pension, a trust fund, another job, real estate income, royalties, or alimony, but from playing poker for a living. If you do, you are. If you don't, you're not. Simple. 2. Are you a semi-professional poker player? This, too, is a fairly simple question to answer. If you don't chiefly support yourself by playing poker, do you derive some of your income from playing poker? Does it add to your bottom line at the end of the year? You need to keep records of your wins and losses. If you don't do so, you're not a semi-professional. And if your losses exceed your wins, you're also not a semi-pro. 3. Are you a poker hobbyest? That is to say, are you an enthusiast who plays poker as a hobby, much as a golfer or fisherman indulges in their favorite pastime? And does this enthusiasm ever cross over into being an obsession — or worse yet, an addiction? This is more subjective territory to be sure. To help you figure out just how obsessive you are about this game, consider the warning signs below. If two or more of the six signs below apply to you, you may be considered an obsessive poker player. You keep a razor and toothbrush in your car just in case you have to go right to work after playing poker all night. You go out to eat with a friend, and when the bill comes you ask, "Do you chop?" You return home early one morning from another long poker session and get greeted at the door by your child screaming, "Mommy, a stranger's breaking into our house!" You ask the bank teller to "color up" your five $20s into a $100 bill. You can categorize all of your friends as either "calling stations," "maniacs," "rocks," or "ABC players." You go to a large family function, find your table, and sit down next to a particularly annoying relative. You say to the waiter, "Excuse me. May I have a seat change button?" This list is obviously tongue-in-cheek. Truth be told, being obsessive about poker isn't necessarily a bad thing in and of itself, unless it begins to interfere in negative ways with other important areas of your life. 4. Are you a compulsive gambler? As noted, it's possible for some poker players to slide over from obsession into something more destructive. In order to address the topic of compulsive gambling more directly, in my next column I will ask you the 20 questions from Gamblers Anonymous for you to ponder, and give you my own answers as well.